Is the cost of your energy bill atrocious? Then you might want to consider switching to a more energy efficient home cooling system to save money in the long run. An Energy-Star approved ac unit can cut costs and make all the difference. You wouldn’t believe how much of your monthly bills are influenced by heating and cooling. The fact is, your air conditioning system is the most important factor that affects the total cost of energy use in your home. Maintaining a cozy average room temperature is actually the most expensive part of home comfort. Because of this, any changes applied should make a huge difference in the end. Why should you switch to an energy efficient ac unit? Did you know that about half of the average homeowner’s energy bill comes from air conditioning and heating? Not to mention, the energy it takes to run the air conditioning can equate to up to 70 percent of the average electric bill in a warm, subtropical place such as the Tampa Bay area. Imagine the difference a more energy efficient ac unit would make? It’s amazing how much of the average bill cost you can cut with home air conditioning savings. An energy efficient unit is well worth it in the long run since Energy Star-qualified models use an average of 25 percent less energy than units made before the the end of 2000. A new ac upgrade may be just what you need to lower your monthly utilities. Americans consume more energy than the entire continent of Africa. Keeping in mind the fact that Africa is considerably larger (and hotter) than the United States, it’s astonishing to think that Americans manage to rival and even beat an enormous desertous landmass at energy use; yet, we absolutely do! More food for thought — did you know that according to NPR, the Department of Defense spends an average of $20 billion per year on air conditioning budgets in Iraq? This outstanding figure exceeds the total yearly budget for NASA. All the excess electricity use takes a toll on mother nature. By bringing down the average cooling cost one home at a time, the future becomes a much brighter place for generations to come. If your AC unit meets the EER (Energy Efficient Ratio) and SEER (Seasonal Energy Efficiency Ratio) requirements necessary, then you’re eligible to receive a 30 percent federal tax credit from the IRS. Find out if your ac unit qualifies for the discount by contacting your HVAC Tampa contractor for the specs. You’ll want to request the Manufacturer Certification Statement for the particular air conditioning unit you plan to purchase in advance. It’s best to let the air conditioner installation company know by specifying this particular requirement before choosing the best ac unit for your home. Ready to make the switch to a new energy efficient ac? There are plenty of reasons to opt-in for new air conditioning system. 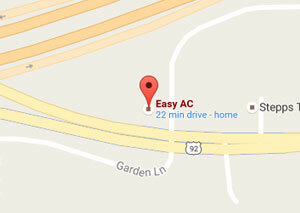 If you’re in need of new air conditioning installation or ac repair in the Tampa Bay area, Easy AC is at your service. 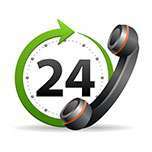 We’re available 24 hours a day, 7 days a week for a quick response to home comfort emergencies. Give us a call today.